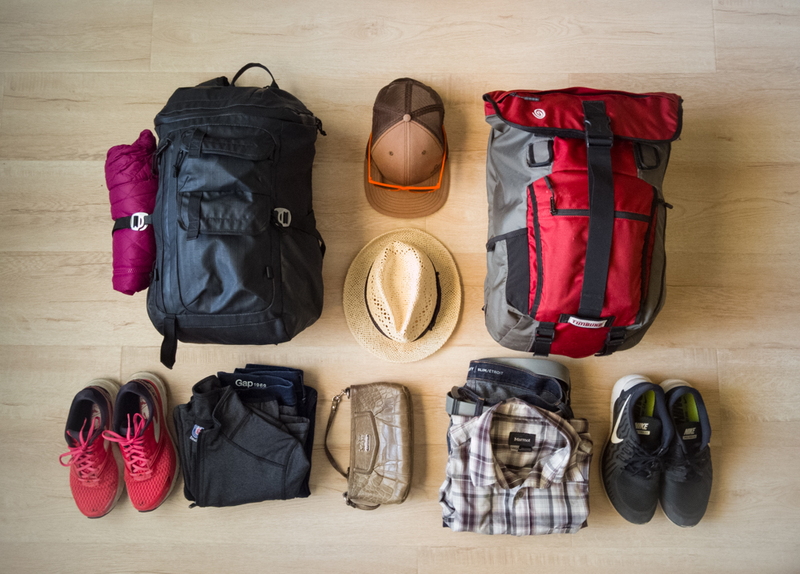 Whether you’re headed abroad for two weeks, months or years, if you want to pack light for an easy backpacking trip, steal our packing strategies and lists here! We traveled between cities mostly by bus, train, or plane, only renting a car for small portions of our trip. Once at our destinations, we walked and took public transportation to get around. Through Airbnb we booked some fantastic local apartments (get a discount off your first stay with our link), and occasionally we stayed at a well-rated budget-friendly hotel booked through hotels.com (get $50 a $300 booking). At first, we thought twelve countries in two months may be too ambitious for us — it involved a decent amount of transit time between destinations and it’s considerably faster than we typically move — but it proved to be a lovely, relaxing trip thanks to light packing. Our detailed bag contents are shown and listed below. Hers on the left, his on the right. Diana’s stuff is the ABC’s and Ian’s is the 123’s. The following items were especially handy throughout our trip. Together they helped us stay organized and comfortable and kept our valuables safe. great for those traveling with expensive tech gear, especially a laptop or other item too large to fit in a hotel safe. We used this almost everywhere, about 80% of the time. perfect for keeping clothes organized inside your bag. We used these the whole time. Ian prefers the larger cubes, and I prefer the smaller ones. a handy, multipurpose sack. I stored either my camera or Macbook charger inside the medium ditty sack in this set. a fantastically packable daypack solution. 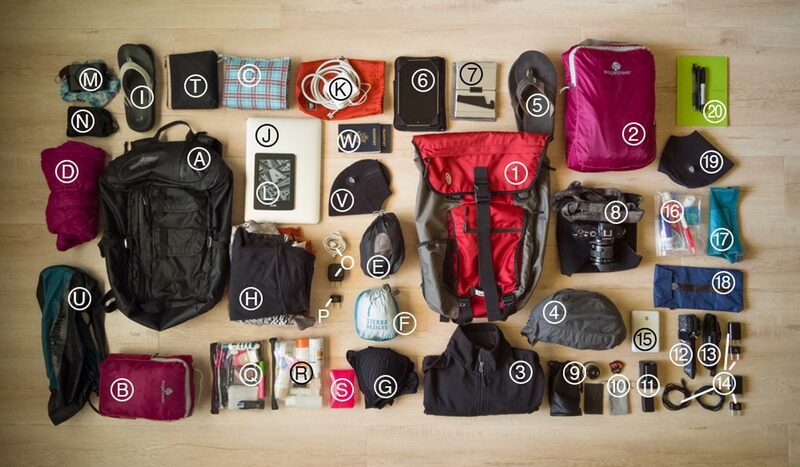 We used this every single day in Europe for everything from grocery shopping to stowing jackets and cameras. a flexible padded wrap with velcro great for cameras and other electronics. Ian stored his Sony a7S in this throughout the trip. ultra lightweight, come with their own stuff sacks, and also useful in chilly or windy conditions. They’re super easy to take along in your daypack just in case you need them. Here are 10 guidelines we stick to when we need to pack light for any trip. Limit yourself to one backpack. Everything you aren’t wearing should fit inside it. Pack for a 5-day trip, despite the length of your trip, and plan to do small amounts of laundry in the sink throughout. Pack lightweight, quick-dry clothing items (e.g. synthetics instead of cotton). This will allow you to pack fewer items since doing laundry will be less of a hassle. We really like ExOfficio underwear, and Ian’s a new fan of Uniqlo heattech tees. Pack versatile clothing items (e.g. neutral colors and items that layer well and give you a variety of outfit options). Don’t go overboard with “just in case” items. Don’t pack too many toiletries. Shampoo and soap is provided nearly everywhere, so skip those. Toothbrush and travel toothpaste: yes, of course. It’s also okay to pack a few “emergency” 1-oz toiletries (which will save you loads of space over the 3-oz max size), but stick to things you use every day that a hotel may not provide you (e.g. conditioner). You can always buy toiletries abroad if/when you need them at a supermarket or pharmacy in Europe. Note: I packed an empty 2-oz plastic squeeze bottle (useful for any liquid I may want to hang on to a flight-size portion of) and an empty plastic soap container so I could hang on to my soap once I needed to buy it. Pack no more than two pairs of shoes. We each packed athletic shoes and flip flops, wearing the athletic shoes whenever in transit. Fold, don’t wad, your dirty laundry. It doesn’t have to be a pretty folding job, but this will ensure your dirty laundry doesn’t take up more space than it did when it was clean. We each kept most of our clean clothing items in a packing cube, and I got in the habit of folding my dirty clothes and stacking them at the bottom of my bag. Keep items you need to access easily accessible. I keep my passport, hand wipes, Kindle, and jacket handy at all times. Toiletries on top for airport travel. Keep your organization consistent. Store things in the same place in your bag each time you pack up to head to a new destination. Designate a pocket in your bag for your passport. This will help you find stuff more easily and make it easier to notice if you’re missing something. 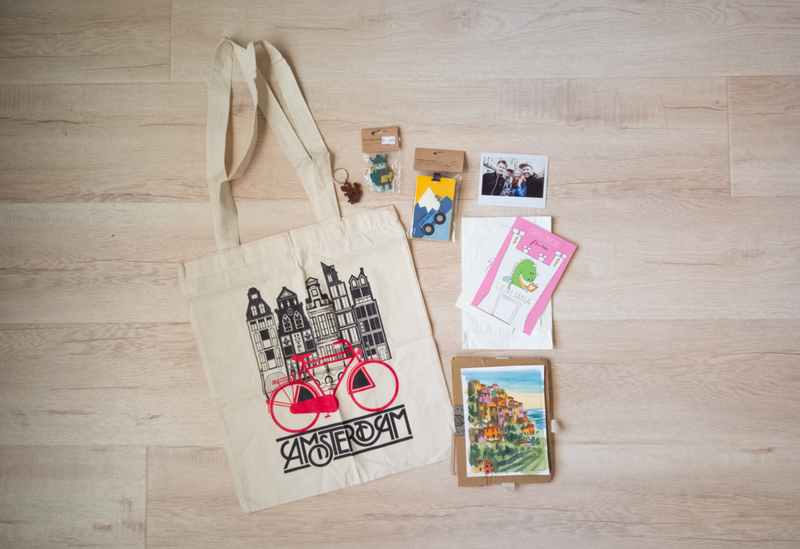 Don’t forget to save space available for a few small souvenirs! If you found this post helpful, check out our other Europe posts. Good luck packing light for your Europe trip! Hello! I’m wondering if the backpacks used are carry-on size? P.S. SUPER helpful list! Thank you!! Yes! Both backpacks are both carry-on size. Sometimes we even put these bags under the seats in front of us as our personal items (although that’s a bit of a stretch). Hi Natalie and thanks for reading! How quickly you move around in Europe should depend on your travel style and the places you’re most excited about seeing. Don’t feel like you need to budget the same amount of time in each place. Some places (e.g. Italy, Iceland) you may wish to relax and take your time, maybe spend at least a week or two there, and then maybe you have some places you want to see but don’t really feel the need to spend a long time there. Limit those to just one or two nights. I definitely recommend not trying to move too far too fast. Plan a good route that keeps your travel time to a minimum, limiting your travel time to 3-4 hours no more than twice per week. I found bussing around Europe to be the easiest. Low key, safer than trains, simpler than flying… and almost always WAY more affordable. (Check out FlixBus and MegaBus.) For 18 countries, I’d plan on spending 2-3 months, but it’s totally up to you and your travel buddy (and how much time you think you can reasonably stand to spend together, too). I’d love to hear how your trip goes. Have fun planning, and please feel welcome to share your itinerary once you figure it out!